During the holidays at Domenica in New Orleans, chef Lisa White serves up this delicious aged Creole eggnog. Try this recipe now, and pop it open on Christmas Day. 'Tis the season for eggnog! From putting it into lattes to deep-frying it, we can’t help but go crazy for this holiday staple. 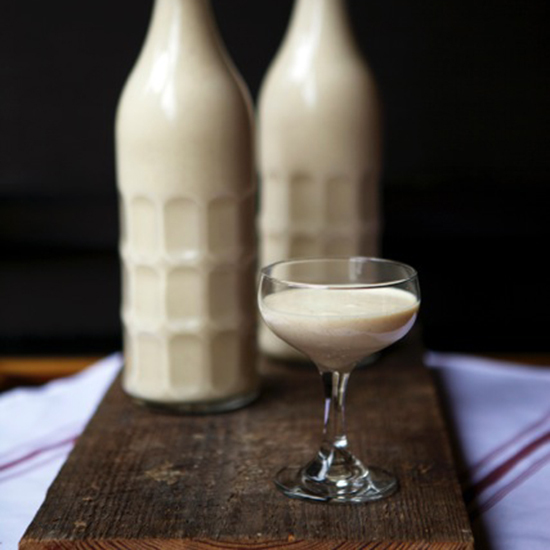 What better way to deal with the stress of meal planning, gift buying and family get-togethers than good, boozy eggnog? At John Besh’s restaurant Domenica in New Orleans, chef Lisa White serves up just that. She combines four different liquors, along with the traditional eggs, cream, sugar and spices. The secret to this recipe is the aging process, which, she says, "mellows the alcohol and makes it creamier and thicker over time." Here, the recipe for her Creole Eggnog. From Lisa White, pastry chef at Domenica. 1. In a medium bowl, whisk the eggs with both sugars until smooth. Set aside. In a medium saucepan, warm the cream over moderate heat until simmering. When the cream is hot, slowly pour 1/3 of the liquid into the sugar and eggs while whisking continuously. Once incorporated, slowly pour the cream, eggs and sugar into the saucepan with the remaining cream, whisking continuously. Whisk over moderate heat until 145° and warmed through, about 1 minute. Remove the saucepan from the heat and strain the cream into a large bowl. Cool to room temperature. 2. Once the cream is completely cool, whisk in the vanilla, spices, bitters and alcohol. Refrigerate in a food-safe container with a lid. Shake or stir the container once a day for two weeks. After two weeks, enjoy!